MORE than half a century ago K.L. Saigal—the greatest musical genius of the 20th century—passed away in the prime of his life but it is a pity that we have not set up any befitting memorial in his honour. The first superstar of Indian cinema, who brought music to the masses and became a legend in his own lifetime, deserves to be honoured at the national level. Saigal’s god-gifted voice and his haunting melodies still continue to delight millions of fans the world over and have become a part of our heritage. It is disappointing that no auditorium, institution, street even has been named after Saigal to keep his memory alive. The coming year, 2004, will mark Saigal’s birth centenary. This should be an opportunity occasion to repay our long-standing debt to K.L. Saigal, the true Tansen of our age. Saigal was deeply attached to Jalandhar, his beloved hometown. Even when his health was declining and he was conscious of his approaching end, he came all the way from Bombay to spend his last days there before his demise on January 18, 1947. Right from his childhood, Saigal had shown an amazing understanding of music. As a school boy, he used to attend kirtans in the temples and take part in the Ram Lila. He often visited the dera of a Muslim dervish and Sufi Salamat Yusuf in Jammu, whose life and spiritual leanings he was influenced by. Music was a daily routine at this dera and Saigal is said to have practised his singing there along with other musicians and devotees. Apart from folk and devotional music, the enjoyment of regular classical and other popular music in those days, was for those privileged few who either had access to the private concerts of the princes. Saigal would sneak near the house of a professional singing girl in his neighbourhood and later emulate her singing. Some fans find a flavour of kotha style in Saigal’s rendering of ghazals. Saigal gave a totally new dimension to the music of his time when he appeared on the scene in 1930s. Saigal’s non-film music — ghazals, geets and bhajans made him popular with the music lovers. For him, singing was as natural as breathing, beyond the usual limit of skill and style. Without any formal training in the art of singing nor a torch-bearer of any gharana, Saigal was an acknowledged master of his art in every element that makes music mighty. He had the marvellous gift and the heavenly voice to create out of those seven notes — sargam — a ringing rainbow of colours, full of expression of every single emotion known to man. No wonder, the elemental force of Saigal’s music stunned the great music maestros of his time like Faiyaz Khan, Abdul Karim Khan, Bal Gandharav, Pt Omkar Nath and others who were amazed at his instinctive understanding of the ragas and his regal resonant voice, with a touch of the divine. It is said that after hearing him sing a short khayal in raga darbari, Faiyaz Khan told Saigal "My dear boy, there is nothing I can teach you now that will make you a greater singer". As a man, Saigal was humane, modest, gracious, overgenerous and full of compassion. Least conscious of his achievements, fame and fortune, he made no distinction between rank and class. According to a reliable source, Saigal once declined an offer of a substantial fee for performing at a wealthy household but chose to attend the function at the house of a modest employee of the Kedar Studios at Bombay. Since he did not follow any religious rituals, he was more like a Sufi saint. Music was an effective instrument for sublime communion..
On a personal note, I vividly remember Saigal’s live performance I witnessed at Lahore in December, 1937, during an All-India exhibition held at the Minto Park. By that time, Saigal was already a household name all over the country. There are many stories about his addiction to the bottle and his inability to sing without its aid but there is no evidence to support them. Like the great poet Ghalib, immortalised by the ghazals sung by Saigal, the bottle had its fascination for him but that did not in any way affect his faculties. However, it will, always remain a mystery whether he sang better with or without the influence of liquor. It was B.N. Sircar, the founder of New Theatres, Calcutta who discovered Saigal and presented him to the Indian public. Calcutta, in those days, was the Mecca for the actors, singers, dancers, scriptwriters, music directors, and all those who aspired for a career in the show business. It was in Calcutta that K.D. Mehra of Lahore made the first Punjabi film Sheila or Pind di kudhi. Saigal’s first three films Muhabbat ke ansoo, Subah ka sitara and Zinda lash went unnoticed. But his talent for both acting and singing was fully recognised after the success of Yahoodi ki ladki a costume epic based on Aga Hashar Kashmiri’s famous play Misarkumari with 19 songs including Saigal’s ever popular Ghalib number Nuktachin hai gham-e-dil. It was around this time that Hindustan Records Company of Calcutta brought out Saigal’s maiden recording Jhulana jhulao which blazed a new trail in the Indian music and won him acclaim from knowledgeable music lovers. Saigal’s film music style was largely shaped at New Theatres which had then a galaxy of music directors like R.C. Boral, Timir Baran and Pankaj Mullick who composed most of the songs which remain among the most popular hits of Indian Cinema. Saigal attained stardom with the release of New Theatres’ Chandidas in 1934. The phenomenal success of the film set a new trend, establishing the dominance of songs and music in Indian cinema which continues to be a major audience attraction even today. 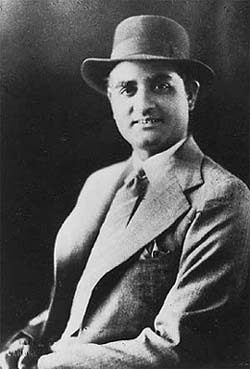 Saigal was acclaimed as the leading singing star and the haunting songs like Tadpat bite din rain and Prem nagar mein banaungi ghar main made him famous. Never before had such a soul-stirring voice ever been heard. Then came the all-time great Barua’s masterpiece Devdas, Saratchandra’s classic time-honoured enduring story of unrequited love. Here, Saigal’s outstanding and historic performance set the standards for musical melodrama acting. With his stunning portrayal of Devdas, Saigal brought the author Saratchandra’s desperate character to life. His brooding looks, that drooping lock of hair and his mournful singing Dukh ke ab din bitat nahin made him a cult figure and Saigal became the first superstar of Indian cinema. Saigal was not conventionally good looking but the audience was struck by his demeanour and mannerisms. His golden voice was refreshingly impressive and along with his songs even his dialogues were on the lips of the love-lorn gallants of the 1930s as the ultimate expression of dejected love. Saigal was a bilingual artiste and his mastery over the Bengali language was recognised even by Gurudev Tagore when he allowed him, the first non-Bengali artiste, to sing Rabindra Sangeet. He also played lead roles in several Bengali films which made him the darling of Bengali fans. Devdas was followed by Karwan-e-Hayat an adventure movie and Pujarin, the Hindi version of Dena Pona. It was in the latter film that Saigal sang that fascinating number Piye ja aur piye ja, perhaps, the only film song that was recorded without any rehearsal or any set composition. The magic of this melody, when he is talking and singing, electrified the tipplers and enhanced their pleasure. Unlike other studios, New Theatres did not exploit its talented stars and Saigal did only one or two films a year. In 1937, Saigal appeared in President which was again a runaway success. He was versatile in his tastes, lending his voice to all types of songs as we find in that memorable number Ek raje ka beta lekar a rare fusion of prose and poety. The following year, New Theatres came out with three reputed films starring Saigal, viz Dharti mata, Dushman and Street singer. The last one elevated Saigal to a new pinnacle of glory along with Kananbala with that immortal, melody Babul mora nayhar chhuto jaye which enraptured countless fans. Then followed Barua’s Zindagi (1940) with Saigal’s evergreen lullaby So ja raj kumari soja and Lagan (1941) with Kananbala, an Indian version of the romantic stereotype of the artist, a forerunner of Guru Dutt’s Pyaasa. It had that Saigal’s moving melody Ye kaisa anayaya data. Saigal left Calcutta in 1941 to join Ranjit Studios in Bombay. There Chandulal Shah and his team capitalised on his talents and produced two outstanding films Bhagat Surdas and Tansen. Saigal co-starred with another highly talented singing heroine Khurshid and both these films were box office hits. Saigal’s popularity reached new heights with those great songs like Nayan heen ko raah dikha prabhu, and Diya jalao. 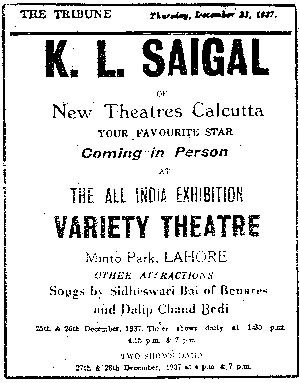 In 1944, Saigal went to Calcutta to work for New Theatre’s production, My sister, whose success was entirely attributed to Saigal and his singing. No fan of his can forget that heart-rending number Ai qatibe-taqdir. Back in Bombay, Saigal was signed up for a number of films by the producers there who were keen only to exploit his name and fame as the leading singing super star of the day. These films, however, like Tadbir, Banwara, Kurukshetra, Omar Khayyam and Parwanadid not make any mark. The music directors in Bombay were vying with one another for an opportunity to compose music for Saigal. Finally, it was Naushad, who teamed up with Saigal in Kedar’s masterpiece Shahjehan. This was the last great musical hit that keeps alive the memory of the great super-star K.L. Saigal with those sublime songs like Gam diye mustaqil and Jab dil hi toot gaya. K.L. Saigal was also a poet and a composer. He is said to have recited his own compositions though no recordings are available, except the one Main baithee thi phulwari mein, a remarkable bhajan which reveals his spiritual leanings and substantiates the statement of his cousin Chaman Puri that Saigal was a great devotee of Lord Krishna and often sang bhajans to his mother. He was also a competent composer and is believed to have composed most of his non-film music. According to Kidar Sharma, it was Saigal who set the tunes of those two famous numbers, Balam aao baso mere man mein and Dukh ke ab din bitat nahin. According to Jaimani Roy, the renowned artist who knew Saigal from his earliest days in New Theatres,"Saigal was such a pure character, so simple, that it is hard to describe him in simple words. He was like somebody who had stepped out of an icon, so unaffected, totally oblivious of himself, like a line drawing". All creative artists, poets, painters, dancers and singers receive inspiration from the invisible or the cosmos as Ghalib put it Aate hain gaib se ze mazamin khayal mein — Ghalib sarire-khama nawai sarosh hai (these thoughts or ideas emanate from the heavens, oh Ghalib, your pen is only the scribe of the voice of the gods). And that was so true of Saigal as well.